LAWS #42 was incredible! The performers brought their shares in many different ways: comedy, guitar, song, visual art, poetry, spoken word, thoughts, collaboration. Hot Sauce Holiday was the featured artist, and they created an unforgettable experience for us all: education: germs are everywhere. Also, helpful: Rambles (from Hot Sauce Holiday) found his missing kitty cat, Meow Meow. Johnny O, Rafa, Mike, and Lorna got lots of birthday loove. And cookies. Only one candle, though. Good thing they’re flexable. I want to officially invite you to next week’s LAWS #43 Cookies! Check it out! Join the event! See the full LAWordSalon from El Diablo y/o California ! 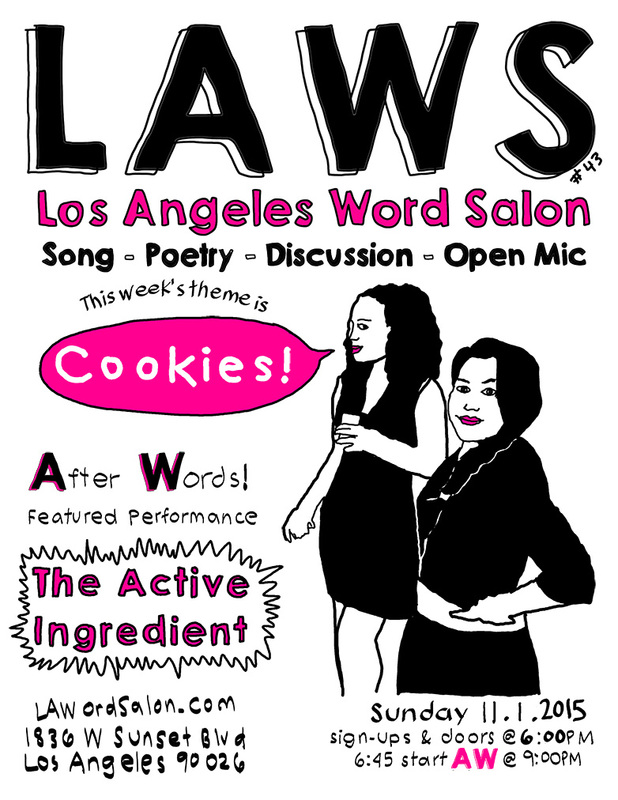 ← LAWS #43 Cookies with The Active Ingredient featured [A]fter[W]ords is this Sunday in #echopark!